When working in a busy kitchen, you need to ensure staff are protected in the event of an injury. The Masterchef All Blue Catering First Aid Kit is a superb kit designed specifically to be used in all types of food preparation areas. Minor mishaps can occur from time to time in the kitchen, so it is best to be prepared in the event of an incident. 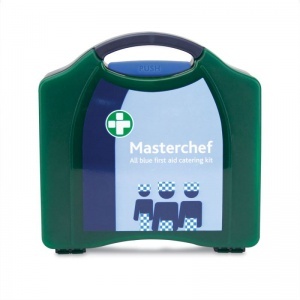 Each Masterchef kit case contains materials that are coloured blue so that they are detectable, meeting the conditions set out by the Food Safety Act (1990). 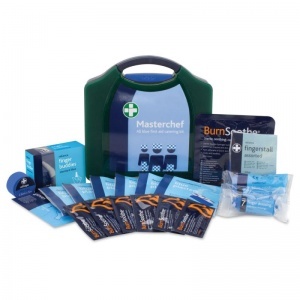 What's Included in the Masterchef Kit? Each kit comes in a durable, airtight Aura case that protects the contents within from moisture or dust. You will never be far away from competent assistance during times of need with one of this handy kits stored away in your kitchen area.